The dome of the Jefferson Memorial is covered in layers of biofilm, leaving it dark in spots. The National Park Service is budgeting to remove this biofilm with lasers in 2018. The Jefferson Memorial’s iconic white dome has been plagued by a dark colony of microscopic organisms growing on the memorial for the past decade. Soon it will be white again. The National Park Service said Tuesday a test using laser ablation to remove the biofilm darkening the dome was successful. The test’s success will allow them to clean the rest of the memorial. “The level of clean that was achieved exceeded our expectations. We were able to clean the stone in a safe manner that protected both this cultural resource and the surrounding natural environment as well,” said Justine Bello, an architectural conservator. 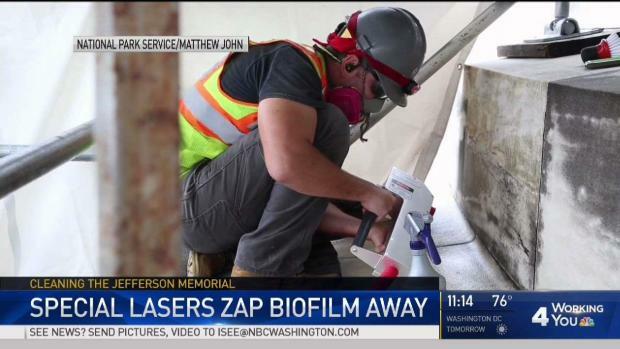 The National Park Service is using lasers to clean the biofilm that is leaving dark spots on the Jefferson Memorial. News4's Megan McGrath takes a look at how it's done. Laser ablation was chosen as the method of removing the grime because it is not harmful to the stone like chemicals or a pressure washer might be, the National Park Service said. The use of laser is also an environmentally friendly procedure in comparison to more abrasive cleaning methods, the National Park Service said. Conservation of Sculpture and Objects Studio, Inc., a Chicago-based conservation firm, conducted the laser cleaning test, using G.C. Laser Systems to remove the biofilm without chemicals or residues. Over the past month, the test treatment cleaned 1,000 square feet of the 10,682 square feet dome. Scaffolding will be removed from the Jefferson Memorial in the next week, and efforts to remove the rest of the biofilm is currently slated to begin in 2018, the National Park Service said. The project is included in the National Park Service’s 2018 fiscal year budget. Cleaning efforts are not disrupting visitation of the memorial.